My first time in Cebu City was year 2008 when I attended the International Tourism Forum at Mactan Shangrila Hotel. From then on I considered Cebu as one of the most beautiful places in the country with its bustling commercial position and palatable seafood dishes, among others. Last August 13-14, 2012 I got another opportunity to be back to the Queen City of the South with a different purpose: traversing the city of Mactan up to its last frontier which is the Municipality of Santander. Together with some local authorities of Sta. Cruz, the trip was officially designed so that we could gather vital yardsticks regarding investment promotions and tourism development that may be applicable to Sta. Cruz setting. We had a very fruitful meeting at Mactan with the administrator and personnel of the Philippine Economic Zone Authority (PEZA), after which we then had a tour around its Economic Zones 1 and 2. Mactan Economic Zones are one of the best examples of a successful PEZA-registered economic zone, catalyzing economic development in Lapulapu City and surrounding environs. On the second day we travelled all the way to the Municipality of Santander, a distant town of Cebu being considered as Cebu’s last frontier and gateway to Negros, Dapitan and Siquijor. This town boosts of its scenic coastline with fine white sand resorts. It also takes pride of its delicacy called “tostado”, a toasted biscuit with pounded sugar spewed in its top portion. With its popularity, the town crafted the annual celebration of Tostado Festival. There are actually great things to discover in the province of Cebu other than the busy life of the city. Our trip to Santander allowed us to appreciate the other towns’ beautiful wonders. Talisay is a booming city. Carcar is another promising city known for its shoe factory, pork chicharon and ampao. Argao is one of the more famous towns being the gateway to Mama Mary’s Sanctuary in Simala, perhaps the most dominant catholic-inspired architecture in the entire country. The town of Alcoy is an added promising attraction in the province. The town of Dalaguete also shares its famed “torta” delicacy, a food item that has over the years been replicated in Ceboley, Sta. Cruz. It was in Dalaguete also that I tasted the strange but tasty Banana-Meat, an ordinary banana que inserted with grind pork. 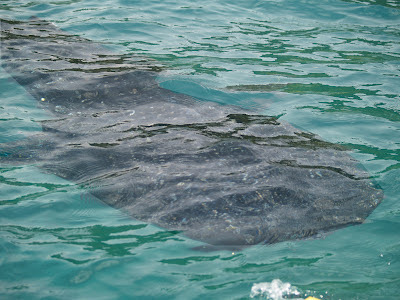 The one town in Cebu that amused me much was Oslob, as it features whale sharks as a main tourist attraction. I took the boat ride together with colleagues Mam Camille, Cheryl and Sir Ben to personally witness the mammoth-sized whale sharks or butandings. We have seen so much of butandings there as locals tried to feed them when visitors come. At a package rate of 300 pesos per head, one will be able to take first-hand experience of butandings trying to blend with humans in Oslob, a very spectacular experience. Cebu province is undeniably one of the bests in the Philippines. I’ve been to so many places in the country but Cebu has really captured my interest. It is the country’s highly commercialized city next to Manila but it certainly ranks on top in terms of Filipino hospitality and managing the wealth of wonders. It also sits on top of religious conviction with the presence of the Mama Mary Shrine in Simala, not to mention the world renowned Sinulog Festival. I have blogged so much about Philippine destinations but Cebu will always be a prime place that I will keep coming back and keep blogging back. This is really interesting. I am planning to visit cebu next year with my friends. Glad I found your post. Thank you.